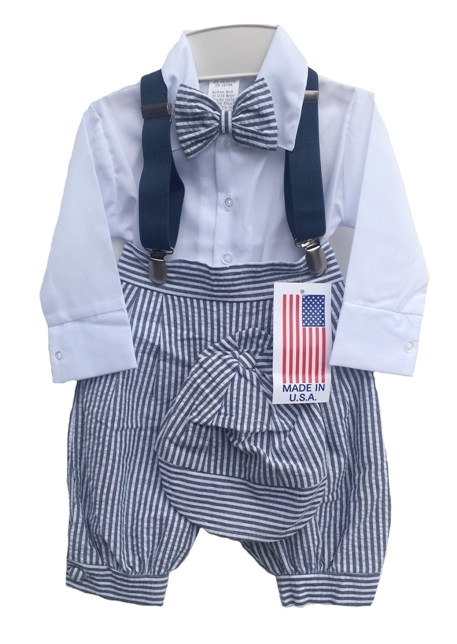 This boy's 5-piece knickerbocker set couldn't be cuter for your Dapper wee laddie! The vintage style knickerbockers are made in an ever-popular charcoal and white striped seersucker fabric. 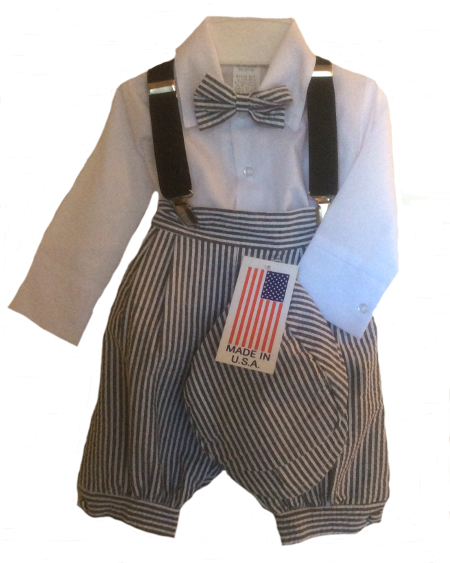 The 5-piece set includes a white shirt, clip-on bow tie, pie cut hat, knicker pants, and elastic black suspenders. The shirt is 65%/35% cotton poly blend. The knicker pants, hat, and bow tie are polyester and have an elastic back. The outfit runs fairly true to size but the hats can be small. The hat has elastic in back. Machine wash gentle and dry on low heat. Infant sizes 6 - 24 mo. Made in the USA by Fouger.